Buy Pukka Turmeric Active Tea - 20 bags in the UK from our online shop or directly from our independent Scottish store. Turmeric Active tea is an organic herbal tea blend including turmeric and boswellia. Turmeric root (30%), ginger root (26%), galangal root (14%), licorice root, nettle leaf, celery seed, burdock root, orange essential oil flavour, triphala fruits (amla, bibhitaki, haritaki). As official Pukka stockist, we sell genuine Pukka Teas directly from our shop in Scotland and online throughout the UK. View more products from Pukka. Where can you buy real Turmeric Active Tea safely online? If you are wondering where you can buy Pukka Turmeric Active Tea - 20 bags safely online in the UK, then shop with us. We are an actual health foods shop; with real people selling real foods and products. Our award-winning independent shop is located in Stirling, Scotland since 1976. You can buy our Herbal Teas, Caffeine Free Tea, Green Tea and other genuine Pukka Teas in store or safely place an order with us online or over the phone. 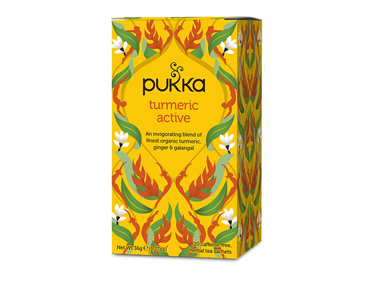 Turmeric Active Tea - Pukka Turmeric Active Tea - 20 bags in Pukka Teas and Herbal Teas.